The HP 9845 is closely related to the Hewlett-Packard Interface Bus or HP-IB, also known as IEEE 488 or General Purpose Interface Bus (GPIB). Most of the HP 9845 periperals such as mass storage, graphics devices or printers can be connected via the HP 98034 HP-IB interface. Even today the HP-IB is the entry to the HP 9845, since it is the easiest and most versatile connection between the HP 9845 and a modern PC. And the required 98034A/B HP-IB interfaces are still relatively easy to acquire. "These bullet-proof cables are wonderful in a museum environment (for those who are not experts in the myriad of forms of data communication in the industry). Getting two HP-IB devices to talk to each other is primarily a simple matter of setting an address switch. No need to worry about strange cable pin-outs, communication or handshaking settings. HP-IB was not as easy as plug-and-play, but it was as close as it got in the day." This is what the hpmuseum says about the HP-IB. The story of the HP-IB began long before the HP 9845. In the year 1965, Hewlett-Packard already was one of the leaders in measuring instrument supply, and digital data acquistion became an increasingly important matter. From the first frequency counter connected to a digital recorder in the mid-1950's demand increased also for the remote programming of instruments in the 1960's. During the late 1960's there already was much experience with bus systems for interconnecting CPUs and internal components, and also diverse instruments and controllers were interconnected with 'bridging' interface cards plugged into a common backplane. So HP's engineers already had good practice in designing internal bus systems. The final step from the backplane towards a cable based network was at hand. The interface system must be capable of interconnecting small, low-cost instrument systems by means of simple passive cable assemblies without restricting individual instrument performance and cost. The interface system must be capable of interconnecting a wide range of products (measurement, stimulus, display, processor, storage) needed to solve real problems. The interface system must be capable of operating where control and management of the message flow over the interface is not limited to one device but can be delegated in an orderly manner among several. The interface system must be capable of interfacing easily with other more specialized interface environments. The resulting interface framework then was contributed by HP in the International Electrotechnical Commission Technical Committee 66, Working Group 3 (IEC/TC66/WG3) as starting proposal. 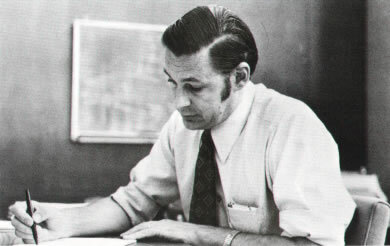 By September, 1974, a draft document of the HP proposal was approved for balloting by the IEC, and in 1975, the Institute of Electrical and Electronics Engineers (IEEE) published their document IEEE 488/1975, "Digital Interface for Programmable Instrumentation" for facilitating the design, assembly and use of instrument systems, which became the base standard document for the HP-IB. An identical standard was published in 1976 as MC1.1 by the American National Standards Insititute (ANSI). The original standard from 1975 was revised primarily for editorial clarification and addendum in 1978 (IEEE 488/1978) and later in 1987 (IEEE 488/1987 or IEEE 488.1). Until that time, the IEEE 488 specified the mechanical, electrical, and basic protocol parameters, but did not standardize any device specific command or data format. That was the domain of the IEEE 488.2 standard, which was first published in 1987 and later revised in 1992. 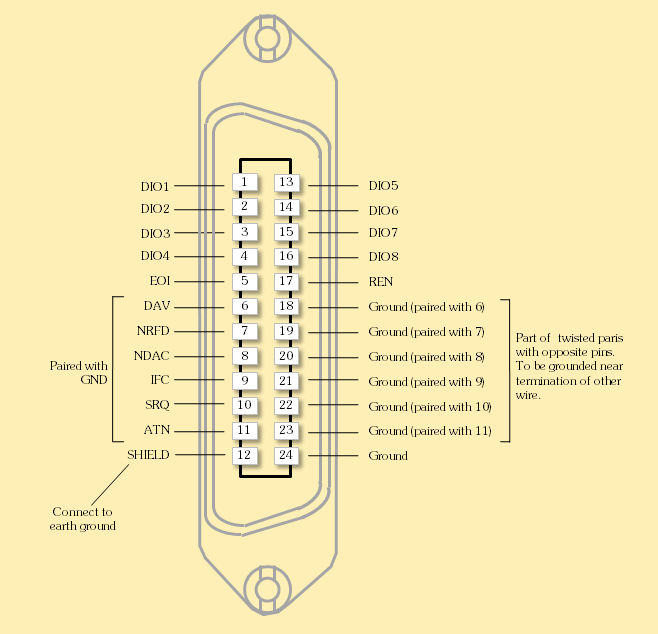 In 1980, the IEC published its own standard document IEC625-1, which was identical except for the 25-pin sub-D-connector (same as for RS232) instead of the original 24-contact Centronics-like connector. In fact, until today still the original Centronics-like connector is used, the sub-D-type never established. There were later enhancements and extensions to the original IEEE 488 standard, such as the Standard Commands for Programmable Instrumentation (SCPI) or National Instruments' own implementation of a "High-Speed 488" (HS-488) with up to 8 MByte/sec throughput, which made it into the standard in 2003. Since any revision of the HP-IB/GPIB/IEEE 488/IEC625 standard newer than IEEE 488/1987 or IEEE 488.1, respectively, is of no relevance for vintage HP-IB capable systems or peripherals, we do not further refer to those newer revisions in this tutorial, but concentrate on IEEE 488.1 which defines hardware, signalling and bus operation, but no high-level command syntax or data formats. Please note: As with most official standards, the original standard documents are not available without charge (even not if they are more than 30 years old) but must be ordered directly from the standardization organisations. However, there are some third party documents available (see the downloads section below). For the HP 9845, the only important standard was the IEEE 488/1978, since the standard HP-IB interfaces for the HP 9845 - the 98034A and 98034B - implemented that revision of the IEEE 488 standard. HP reported that in the year 1982, the IEEE 488 was published in nine languages, and supported by more than 250 manufacturers in at least 14 countries, to design more than 2,000 products. More than 45,000 copies (with an estimated revenue of more than 10 million dollars for the standardization organisations) of the standard had been distributed in 1982. Until today there have been designed more than 5,000 different HP-IB/GPIB devices. So, why was it so successful? The HP-IB was highly efficient: Any device connected to the bus could send data to any number of other devices in parallel. Not just as it is with Ethernet broadcasting to any network adapter on the bus, but with full handshake and flow control capability, hence automatically adjusting the transmission speed to the slowest device in the receiver group. The whole system of all devices connected to the HP-IB could be reset by just a single signal (Interface Clear or IFC) sent by the system controller. The HP-IB was responsive: Sending a command to a device or starting a data transfer is just a matter of microseconds, which is faster than any other peripheral connection even today (including USB and Ethernet). The HP-IB was fast: It applied a byte-serial and bit-parallel scheme for up to 1 MByte/sec or 8 MBit/sec transmission speed (serial connections at the time in general were limited to 9,600 Bit/sec). Typical throughput however was between 250 kByte/sec and 500 kByte/sec. The HP-IB was flexible: Any device could take control of the bus at any time, and networks could be set up either as daisy chain, or as star configuration, or as any mixture of both. Asynchronous events could be actively signalled by any of the devices (e.g. when requiring service or for indicating special status) at any time (as Service Request or SRQ), and device status could be polled either serially (Serial Poll) or in parallel (Parallel Poll) by the controller-in-charge. The HP-IB was versatile: Not only measuring devices can be connected, but also printers, plotters, mass storage devices or human interface devices / controllers. It could even be used as network for setting up peer-to-peer or client-server networks. Also two 'dumb' devices can be connected if required without any need for a controller. And there is no lower limit for transmission speed. The HP-IB was reliable: Within the physical limitations defined by the standard, the active low signalling at TTL level allowed easy implementation with open collector interface logic with low noise and high confidence (or tri-state drivers for maximum throughput). Parity checks could be peformed automatically on every bus control command. 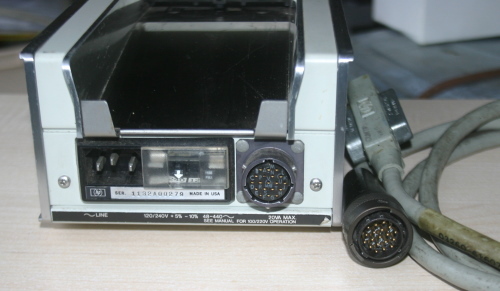 There is no hassle with bus terminators like it is with the later Small Computer System Interface (SCSI), which later replaced HP-IB as mass storage interface, but never as measuring equipment interface. On the other side, the HP-IB lacked hot plugging (there was no indicator for being newly connected to the bus1, and there also was no guarantee that an ongoing transfer would not be interrupted by a new device), and it is recommended to keep all devices switched on. Also, the connector is (at least compared to USB, Ethernet or Firewire) the more clumsy edition. But it is stackable! Actually, in the early days, the HP-IB bus showed to be perfectly suited not only for connecting instruments, but also for the mass storage devices such as hard disk drives, tape drives and floppy disk drives. There was no other connection standard with comparable speed, until the SCSI standard became mature. HP decided to consequently move all of their mass storage devices to the HP-IB standard and developed an impressing number of mass storage devices all providing HP-IB interfaces. 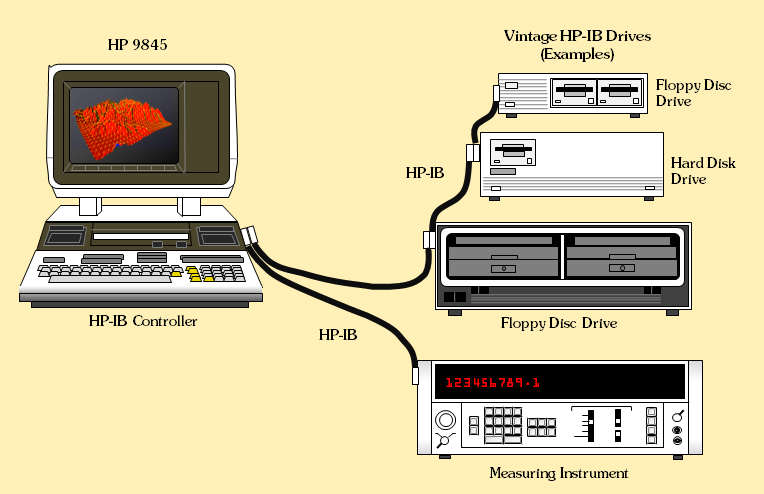 If coupled with an HP-IB mass storage device, many HP-IB instruments were capable of logging their measuring data directly to floppy disk, tape or hard drive without the need for some additional controller. Around 1990 SCSI then took over the role as major standard mass storage interface, but the relevance for talking to instruments via HP-IB still remained. At the time when detached keyboards, mice, trackballs and other human interface devices entered the scene, Hewlett-Packard developed another more suitable technology (with tiny SDL connectors) for attaching those devices, the Human Interface Link (HP-HIL). Compared to other periperhal interconnect standards like the USB, Firewire or SCSI the HP-IB supports dynamic reconfiguration of the controller role (not bound to a dedicated controller adapter) and multicast communication for sending data to multiple receivers at the same time. So in principle, the HP-IB bus ist not only capable of peripheral communication, but also can be used as a network connecting hosts and peripherals. However, this also shows the drawback of the HP-IB. In a special sense, it had been over-engineered since it provides functionality which is not needed just for data acquisition and even not for peripheral connectivity in general. HP once designed it as a data acqusition standard, which was quite successful, but features like dynamic reconfiguration and multicast made it sometimes more complex to handle than it was necessary. 1) This is only partially true. Actually, so-called service requests issued actively by a newly connected device combined with regular polls can be a method to implement hot plugging, which again would suggest the controller to perform a poll in order to identify the new device on the bus. However, conventions on hot plugging were not part of the IEEE 488/1978 standard. The communicaton model of the HP-IB is that of an 1:n communication with three roles which can be dynamically assigned to any of the devices which are connected to the bus: One sender (the talker), an arbitrary number of receivers (the listeners), and a special device coordinating the communication (the controller). It works a bit like in a school classroom: The teacher is the controller who decides who may talk, and who should listen. Assignment is temporary and can change as needed any time. All assignments together are building the communication context. Initially after power-up the controller role is assigned to a special device called the system controller. This special role is fixed and must be manually configured by the operator (e.g. by setting the proper switches on an HP-IB interface). There is exactly one system controller on the bus. However any device can be assigned being bus controller temporarily (controller-in-charge). Basically, the controller is responsible to assign the talker and listener roles to the devices. Once the communication context has been set up by the controller, the talker is free to send data to all listeners on the bus. So normally, a device which needs to receive data waits for being assigned by the controller to listen, and the sender waits for being assigned to talk. Obviously, the listeners should be assigned prior to the talker so that they are ready when the talker starts talking. The transfer is then started by the talker until transmission of all data has been completed or the controller intercepts. The controller role can be assigned in conjunction with a talker or listener role, so that the controller can play both roles at the same time., i.e. assign itself and act as a talker or listener on his own. Normally, the controller is the host computer which controls data exchange with e.g. measuring devices and participates itself as either talker or listener (e.g. for data acquisition). Any controller operation is done by bus commands which are sent by the controller to one or more devices. Some commands apply to all devices connected to the bus, whereas others (like assigning the talker and listener roles) just apply to selected devices. Devices (including the system controller) are identified by a unique (primary) address which is fixed and must be configured manually by the operator (e.g. with an address switch) so that no two devices share the same address. Addresses range from 0 to 30. Assigning talker and listener roles for selected addresses is called 'addressing'. On power-up, every device is in an idle state. Once being addressed as a talker or listener by the controller, it is in an addressed state, until the controller decides to remove the previously assigned roles by 'untalking' or 'unlistening', which then puts the devices back again into an idle state. For just doing data transfers, no more but just the bus commands for setting up the communication context (i.e. addressing the devices as talker or listener and removing those roles) are necessary. The HP-IB standard however defines many more useful bus commands for different purposes such as resetting the whole bus or selected devices, for alerting, for transferring the controller role to another device or for sending trigger messages to all devices in parallel (and many more) which are explained later. But first let's have a look how data exchange is done in detail. All transfers are done bit-parallel and byte-serial via the eight data lines (denoted DIO1 to DIO8). The HP-IB bus differentiates for any byte transmission between command mode and data mode, however in fact both are implemented just by the transmission of bytes (or characters) over the bus, with the only difference that one of the bus management lines, Attention or ATN, is asserted (=active low) during the transfer of commands, and unasserted (=inactive high) for data. The handshake for all transfers is realized with just three wires even for multicast transfers with 1:n handshake. This handshake was somewhat simple but ingenious and protected by HP's own patent. Each byte is transferred during an atomic single-byte transfer step controlled by the three-wire handshake (so-called source/acceptor handshake) both for commands and data over eight data lines in parallel. The basic principle is that the two lines Not Ready For Data (NRFD) and Not Data Accepted (NDAC) are both driven by the acceptor devices and wired OR'ed for all acceptors, whereas a third line Data Valid (DAV) is driven by the source device. For sending a byte, the source waits until all acceptor devices have unasserted NRFD (set to inactive high signalling they are ready for data), configures each of the data lines for the byte to transmit, and then asserts DAV by setting it active low. All acceptors keep track of this signal, and take the byte from the bus once DAV has been asserted by the source. Finally, all acceptors acknowledge that they have successfully read the byte by unasserting NDAC. Again, due to the wired OR, the NDAC line goes up once the last device signals that the byte has been read. So the slowest acceptor finally dictates the duration of each byte transmission cycle. During data transfers, the role of the source is identical to that of a talker and the role of the acceptor is identical to that of a listener. For sending commands, the controller acts as source, and the device which receives the command acts as acceptor. So the roles of source/acceptor and talker/listener are closely related, but finally describe actions on different levels: source/acceptor roles are valid for low-level atomic single-byte handshake, whereas listener/talker roles are part of the high-level, longer-lasting communication context. Actually, all transfers rely on just those eight data lines, the three handshake lines (NRFD, DAV and NDAC) and one bus management line (ATN) as command/data separator. All byte transfers are solely performed by those 12 lines. End Or Identify (EOI) is used for dual purpose: With ATN unasserted it indicates the last byte in multibyte data transfer, whereas with ATN asserted it requests all devices to assert their status bit on the data lines (Parallel Poll) as response. Those four lines provide additional means for bus management, however they are not required for just transferring bytes between devices. So far, for understanding data transfer over the HP-IB, this is all we need to know. However the HP-IB can do more. Any type of control action on the HP-IB bus is called a 'command'. What makes the HP-IB bus a bit complicated is that there are four different types of commands: Single- or uni-line commands, universal multiline commands, addressed commands and secondary commands. Universal multiline commands, addressed commands and secondary commands all use more than one bus line, and therefore transport so-called multiline messages. This needs a bit more explanation. In general, the number of bus lines should be as low as possible. Any additional line means more wires and more bus drivers. Therefore, HP-IB commands in general are just bytes put on the bus with the handshake as described above, but with ATN asserted. The byte value determines which command is issued. Universal multiline commands and addressed commands are both working that way. The only difference is that universal multiline commands do not require a communication context set up before (they simply apply to all devices on the bus), wheras the addressed commands will only be recognized by devices which have been configured as listeners or talker before (depending on the command). Commands for unaddressing devices as talker or listeners (putting devices back into idle state) are examples for universal multiline commands. Asserting any of the bus management lines is called 'single- or uni-line command', and they always apply immediately to all devices which are connected to the bus without any handshake, and therefore can be asserted at any time, even during a byte transfer. Now all the command types explained above have one thing in common: They are all well defined within the IEEE 488 standard, and every command has its meaning. But the HP-IB standard also allows device-specific commands, which have a meaning for a certain device only, which again is defined by the manufacturer of the device and not within the standard. This type of command is called a 'secondary command', since it in general follows a universal multiline command holding the primary address (such as TAD or LAD). One of the possible uses of a secondary command is to select (=address) a subsystem within a device, so the secondary command is also called a 'secondary address'. As with the primary address, the range for secondary address is 0 to 30. The combination of a primary address with a secondary address is also called "extended addressing" since it allows up to 31 x 31 = 961 entities to get identfied. Basically, by using a byte as command information, up to 256 different commands are possible. Practically, the most significant bit of a command is reserved (used for parity), and the next two bits are used to identify addressing commands (talker, listener, secondary), so there are in fact up to 32 commands left in addition to talker and listener adressing & unadressing. The following tables show how the bus management lines and command byte codes are assigned within the HP-IB standard. So as a summary, every device on an HP-IB bus has its own unique primary address, which is between 0 and 30. If so-called extended addressing is used, every device can keep its own set of secondary addresses (again between 0 and 30) for up to 31 subunits. For fully addressing a subunit, the controller must use a combination of the primary and the secondary address. Note: Please don't confuse this extended addressing with the fact, that interfaces may also allow more than one single primary address. In that case, the interface acts towards the bus simply a single device which can be selected or configured with more than one primary address. If a device uses two primary addresses the first is normally called the major address, and the other address is called the minor address. Note that the UNT command is actually a TAD 31, also the UNL command is equivalent to LAD 31. Establishes Serial Poll mode for all devices on the bus. Once addressed to talk, each device will return a single status byte. Terminates Serial Poll mode, so that no device responds on being addressed to talk with its status byte any more. To be complete with the mnemonics, the acronym DAB is used to denote transfer of a data byte (in contrast to a command byte). The actions described above are all part of the IEEE 488 standard. The standard in fact does not require all HP-IB devices to implement all of the HP-IB functionality, but rather defines capability groups, which may or may not be supported by a device. Those capabilities are in general described in the device's manual. Note that there is no error condition defined for the HP-IB bus, so if a device does not support a special capability (e.g. responding to a Parallel Poll), it simply does nothing. Note that the single-/uni-line commands are not mentioned, the only line which is of relevance in this case is the Attention (ATN) line, which is automatically asserted during every command and unasserted during the data transmission (the series of DAB). Also note that parity is not used on the commands (if parity is enabled, HP-IB is normally using odd parity, which means that the MSB will be set if the sum of all bits without the parity bit is even, but parity in fact is not part of the IEEE 488 standard). 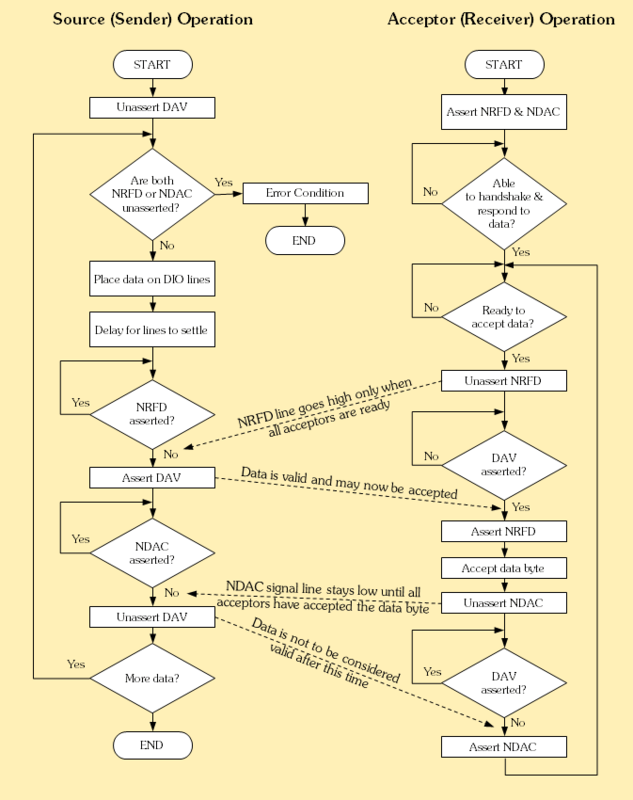 1Actually it is not defined whether ATN should be asserted or unasserted if the bus is idle (neither command nor data transfer is intended), same applies to NRFD and NDAC. So some controllers are unasserting ATN after each transfer, and some don't. For the devices this should not matter. However once ATN is asserted, all devices are required to assert (pull low) their NRFD and NDAC lines immediately (within 200 nanoseconds) so that the three-wire handshake can start. REN is normally asserted permanently so that all devices allow remote control all the time. Before any action on the bus can take place, the roles have to be assigned to all devices which shall participate in that action. This is done by the current controller (controller-in-charge). In most cases the controller has just to address all receivers as listeners, and the sender as talker. Then the desired action can be performed (e.g. a data transmission). That configuration will be valid until the bus gets unconfigured by putting all devices back into idle state with Untalk (UNT) and Unlisten (UNL). Unless the roles are changing (e.g. for sending a reply) there is no need to change the bus configuration. Optionally, any of the primary addressing commands (LADx/TADx) can be followed by a Secondary Command (SADx), which normally does an extended addressing for the device (i.e. addresses a sub-component of the device). We can assume that all devices keep track of the state of their HP-IB interface, so that all listening devices will get ready to receive data for storing it into their buffer, and the talking device recognizes that it now may start sending data to the bus. the three-wire handshake ensures that the sender puts the next byte on the bus not before the last device has acknowledged taking the current byte from the bus. There are several methods for terminating the transfer. The sender itself can send a previously defined End of String (EOS) byte code to signal to all receivers that the transfer is complete. No controller action is required for this termination method, however the EOS code must be previously configured for all devices, both sender and listeners, and the EOS code obviously cannot be used as data. This method is especially suitable if only 7-bit ASCII characters are transmitted as data, so that EOS can be any code > 127. It even works if the most significant bit is used as parity bit during 7-bit ASCII character transfers as long as the EOS code is unique. It is also not unsual to use the <CR> character (carriage return) or the <NULL> character as EOS, however the sender and the receiver both have to agree on it. The talker can also terminate the data transfer by asserting EOI during the last byte, which actually is the most common method. Also, the transmission can be terminated any time by the controller sending UNT and UNL to the bus. Basically, it would be even possible to simply assert ATN (which switches the bus from data to command mode and can be noticed by all interfaces at once), however there is no general convention for it, so the talker and the listeners may or may not react in the expected way. Termination with EOI has the advantage, that full 8-bit data can be transferred (so that this is the method of choice for sending binary data), and that the transfer can be continued without the need for re-addressing talker and listener(s), since the current addressing will not be changed. Sending an additional UNL signals that no further data will follow (all listeners will be put into idle state). However, termination with EOI requires to perform at least a single data handshake with EOI asserted. Asserting EOI alone has no effect at all. So for correct handling of a zero-byte-transfer, the transfer should normally be terminated with an UNT to the sender and UNL to the receivers in any case. Alternatively, the sender can send a dummy extra-byte with EOI asserted and the end of each transfer, but the receivers must explicitly know that they have to discard this extra byte. Also, any transfer can be intercepted by the system controller by asserting Interface Clear (IFC), which resets all devices to their idle state and also transfers the controller role back to the system controller. For an example see the Notation section above. Carriage Return character <CR> is used in this example as EOS code. Note that in general a status byte can be read just once from each device, before reading the status byte again the controller should shortly assert ATN. Also note that bit 6 of the Serial Poll response is reserved and cannot be used as status information (it should be ignored by the controller). So in fact 128 status codes can be used by the responding device. Sending a Serial Poll response is normally an automatic function of the device's interface. The device itself has just to configure the status byte response once, which is then sent automatically by the interface to the bus on every Serial Poll without further notice. Since there are no more than eight data lines, and all device should be ideally assigned to separate data lines, no more than eight devices may respond to a Parallel Poll in order to get an unambigous response. However, devices which are configured to the same Parallel Poll response are simply OR'ed. Also, because there is just the possibility to either assert the response line assigned to a device or leave it as is, the status information delivered by a response to a Parallel Poll is binary (in contrast to a Serial Poll, which features up to 128 different status codes). As with the Serial Poll, sending a Serial Poll response is normally an automatic function of the device's interface. The response has to be configured once (either by the controller by Parallel Poll Configure + Parallel Poll Enable, or by the operator setting the proper switches on the device), which is then sent automatically by the interface to the bus on every Parallel Poll without further notice. The device which has initiated a Service Request is required to unassert the SRQ line once it has been addressed to talk during the Serial Poll. Normally, steps (1) and (2) are both done within a single step, because bit 6 of the serial reponse byte is by convention directly connected to the SRQ line, which means that if this bit 6 of the Serial Poll response is set, the SRQ line will be asserted. For that reason, there are only 128 different status codes available for the device. The device gets informed that its status byte has been successfully read by the controller through the three-wire handshake during the transmission of the status byte. If that handshake succeeds, the device knows that its service request is no longer pending. Of course it can happen that more than one device need service at the same time. Since all devices share the SRQ line, it is good practice for the device not to issue a Service Request as long as the SRQ line is asserted because of another ongoing Service Request, but rather wait until the SRQ line gets unasserted again. However, if the controller does a Serial Poll on all devices as result of a Service Request, it can collect and serve all pending Service Requests even if more than one device have placed a Service Request on the bus at the same time. Which again is good practice for the implementation of the controller. Since the SRQ line is wired OR'ed for all devices, it will not be unasserted before the last device's Service Request has been processed by a Serial Poll. The HP-IB model for devices (at least that of IEEE 488.1) actually does not make any assumptions about the whole device, but just about its interface through which it is connected to the HP-IB bus. So if we are talking about 'devices' we - from the perspective of the bus - just mean the device's interfaces towards the HP-IB bus system. For the term 'resetting', we cannot make any assumption about what the device as a whole actually does when a reset is sent over the bus, however it is defined what the device's interface should do. The Interface Clear (IFC) is conducted by asserting the IFC line for at least 100 milliseconds, which is reserved to the system controller. The defined effect is that all interfaces connected to the bus return to their idle state (putting the whole bus into a quiescent state), and the controller role is returned to the system controller (if there is another controller active). The (Universal) Device Clear (DCL) can be sent by any active controller and is recognized by all devices, however it is a message to the device rather than to its interface. So it is left to the device how to react on a Universal Device Clear. There is no assumption (at least not in IEEE 488.1) what the device should do (it can even ignore the DCL). The Selected Device Clear (SDC) also can be sent by any active controller, and has the same effect as the (Universal) Device Clear, but is recognized only by the devices which have been addressed as a listener before. The HP-IB assumes that a device is either in local or in remote control state. In local control state, the front or rear panel controls are activated, and the device ignores any command from HP-IB, whereas in remote control mode commands from HP-IB are processed, but the front or rear panel controls are disabled. If there is a switch at the device which can be used to set the device back into local control mode, that switch can be remotely disabled for all devices simultaneously by sending the Local Lockout (LLO) command to the bus. The common method to put all devices into local control state is asserting both Attention (ATN) and Remote Enable (REN) simultaneously. This also clears a previous local lockout condition if it is still in effect. This operation requires being the system controller. If just selected devices shall be set into local control state, those devices must first be addressed as listeners and then the controller sends a Go to Local (GTL) command to the bus. Putting selected devices into remote control state is done by unasserting ATN and asserting REN simultenously. Any device which is addressed as listener after this will switch into remote control mode. This operation requires being the system controller. Devices can be caused to perform some device specific action simultaneously (e.g. start with data acquisition) by using Group Execute Trigger (GET). This command applies to all devices which have been previously addressed as listeners. The device holds the controller role until it passes it over to another controller capable device, or until the system controller asserts the Interface Clear (IFC) line, which makes the system controller the active controller. The commands described above are all part of the IEEE 488 standard. Now at some point of time, Hewlett-Packard's engineers decided to implement another command, the so-called Identify, which never found its way into the standard and as such is totally proprietary. It provides means for the controller to efficiently query not only what primary addresses are in use, but also which type of device is connected. It works exactly like the PCI Device ID, which is used to select the right driver on a standard PC (actually, PCI hardware also supports a Vendor ID, which was not required for devices all coming from HP). It does so by first sending an UNT, and then a secondary address. If the secondary address matches with its primary address, the device should place itself into talker state and send a two-byte identification code to the controller. So the Identify is very similar to the Serial Poll and the Parallel Poll, but always identifies itself with the same two-byte code. In principle, the Identify is a quite nice feature, since the controller can quickly determine which kind of devices are on the bus, and perform some kind of plug-and-play procedure. However, many of the drivers which are implemented in the operating systems of HP's computers assume known identification codes, or in other words refuse to work with unknown devices. So any device which ignores the Identify command, or which sends the wrong code back to the host, is strictly out of the game. Now setting itself into talker state without primary addressing is - although unusual - part of the standard. The device can send itself a 'talk only' local message (ton), which should force the device into talker state. The point is that the device has to properly detect the Identify command in order to perform the required steps. HP's own HP-IB controller chips PHI, CHI and ABI all had a detection circuit implemented, which automatically sent the proper response without the notice of the device's processor (just as it is with Serial Poll and Parallel Poll). But all other GPIB chips, especially those of other manufacturers, didn't have that circuit since it is not part of the standard. As a consequence, that function has to be emulated. It shows that there is a feature in the NEC µPD7210 that it accepts a primary address 31 for itself. Remembering that normally primary addresses range from 0 to 30, sending a TAD 31 addressing command would be the same as sending an UNT. So, if configured to address 31, a µPD7210 recognizes an UNT as TAD 31. In combination with extended addressing and using the own primary address as secondary address, the µPD7210 now can be configured to get addressed to talk when an UNT is sent with a following secondary command which secondary address matches the device's primary address. Furthermore, the µPD7210 allows using two primary addresses in parallel (major and minor address), so that one primary address can be used to perform normal operation, and the other to respond on Identify commands. Finally, the µPD7210 has a nice Hold-off on Secondary feature built-in, which allows the device to check in a comfortable way whether there is a secondary which matches its own primary address. However, all this works only because the µPD7210 allows being configured to an invalid primary address 31, which actually is a flaw. The trick should work as well with an Intel 8291A because it is widely register compatible to a µPD7210, and it also applies to ASICs running in µPD7210 mode. Unfortunately, no other GPIB chip provides that 'feature'. So it would be up to the processor, not the GPIB chip, to trace whether there is an UNT with following secondary command in real time, and this is practically impossible because of timing issues, especially under a non-deterministic multitasking environment like MS Windows. Which again prohibits proper emulation of HP devices which are using that Identify command with any other chip but a µPD7210. Another workaround would be to use the DAC hold-off (see the next paragraph) for stepping through the UNT and secondary command, but exactly this feature is not implemented by the TMS9914 (it does not provide DAC hold-off with ATN asserted without being addressed as it would be the case for the UNT and secondary command). Few of HP's own devices initially used a TMS9914 chip with OEM controllers, but the processor had to keep up with the Identify, and those later were replaced by 8291A chips. We have learned that the three-wire handshake in theory waits for RFD and DAC get asserted by all devices as it is necessary when waiting for the slowest device on the bus. Now actually processing data is not just a task of the interface, but of the whole device. Once the interface signals to the device that something is going on on the HP-IB (which within the device normally happens either by polling the interface from the device side or by interrupting the processor), the device has to take some processing action, which has to be performed in a secure and complete way and may involve actions that take some time (e.g. allocating buffers before taking the data from the bus), until - when finished - the device signals 'ready' to the bus. RFD hold-off postpones unasserting the NRFD line during a three-wire handshake until the device is ready to accept the next byte of a transfer (either command or data). DAC hold-off postpones unasserting the NDAC line during a three-wire handshake until the device has finished processing the current byte of a transfer (either command or data). Since both hold-offs in principle can be utilized on interface level both during a command or data phase, the acceptor device has a good control over the whole bus in order to keep both the source device off from performing faster than the acceptor device can handle. However, in reality, there are limits. Now, just not completing a handshake can be both the result of an intentional hold-off and of an unintended fault condition, the source device needs to give up after a certain time cancelling the current action in order not to run into a hang-up condition. Also, an acceptor device may give up while waiting for data after a certain time. Unfortunately, the necessary timeouts have not been defined in the standard, so it is finally a matter of which devices are connected to the bus and knowledge of which timeouts they use. If a source is too eager for sending data it can easly run into a situation where there is no acceptor ready. On the other side the source may already have given up when the acceptor starts waiting for data from the bus. So, much can go wrong. This especially becomes a problem with HP's HP-IB mass storage drivers, where in general tight timings are in use. All other timing for the three-wire handshake is well defined, and must be implemented by all devices in order to comply to the standard. Remark: Of course all devices which are in idle state (i.e. not addressed to either talk or listen) must not participate in the source/acceptor-handshake during a data transfer. However, bus debugging can be simplified by intentionally breaking that rule. By just pulling the NRFD or NDAC lines low, you can force stepping through data transfers even at human speed. As long as no device is running into timeouts. Some HP-IB analyzers offer this option. All of the commands described so far are issued from the bus towards the interface, i.e. are maintained by the HP-IB controller. This type of command is also called a remote message. Now in fact every device's interface has two sides, one to the HP-IB and another to the device's internal logic (mostly the processor). Same applies to the controller HP-IB interface, which of course also has a connection to the internal logic behind. The IEEE 488 standard defines a number of commands, which are sent from the processor to the HP-IB interface, thereby controlling the interface from the internal processing logic of the device or the host. Those commands are called local messages. It is up to the implementation of the interface how the local message reaches the interface (normally this is achieved with a special register which is written by the processor, however local messages may also be generated internally within the interface). Some local messages may be implemented both for setting and for clearing a special condition. For example, the Individual Status message can be implemented as both ist (set Individual Status true) and ~ist (set Individual Status false). For distinguishing against the remote messages, remote messages mnemonics by convention are in capital letters (such as UNT), whereas those for local messages are all lowercase. gts Go to standby gts forces the controller-in-charge to become the standby controller and to unassert the ATN signal. No effect if not being the active controller. ist Individual status qualifier ist will be compared to the sense bit received with the last Parallel Poll Enable (PPE) command during a Parallel Poll Request (PPR). If ist and sense bit match (either both are true or both are false), the interface generates a Parallel Poll response. lon Listen only lon forces the listener function into the Listener Active State (LACS). This message should only be used if the interface is the active controller or there is no controller on the bus (e.g. for directly sending data from a instrument as a permanent talker to a printer as a permanent listener). Will be canceled by addressing commands like UNL or the ton message. lpe Local poll enable lpe puts the interface into Parallel Poll Standby State (PPSS), which enables the interface to respond to Parallel Poll requests. ltn Listen ltn forces the active controller into the Listener Addressed State (LADS), which is synonymous to being addressed as a listener. No effect if not being the active controller. lun Local unlisten lon forces the Listener function into the Listener Idle State (LIDS) which is synonymous to being unlistened. nba New byte available nba signals to the interface that a new byte is available for transfer via source handshake. pon Power on pon places the interface into a defined state (initialization). rdy Ready rdy enables the interface to receive a next data byte. rpp Request parallel poll rpp forces the interface to send the Parall Poll command to all HP-IB devices in the system and to conduct a Parallel Poll. No effect if not being the active controller. rsc Request system control rsc transfers active control back to the system controller (normally coupled with the sic message). No effect if not being the system controller. rsv Request service rsv instructs the interface to enter the SRQS and assert the SRQ signal. rtl Return to local rtl forces the interface to change from remote to local control, provided there is no previous Local Lockout (LLO) in effect. sic Send interface clear sic forces the interface to assert the Interface Clear (IFC) signal (normally coupled with the rsc message, since this message is available to the system controller only). sre Send remote enable sre instructs the interface to assert REN thus sending a Remote Enable command to the bus. No effect if not being the active system controller. tca Take control asynchronously tca forces the interface to become the active controller and to assert the ATN signal immediately. If there is a source/acceptor handshake in progress, data loss may occur. No effect if not being the controller-in-charge. tcs Take control synchronously tcs forces the interface to become the active controller and assert ATN when the interface performs an RFD (Ready for Data) hold-off — that is, the acceptor handshake function enters the Acceptor Not Ready State (ANRS), so no data will be corrupted. No effect if not being the controller-in-charge. Manufacturers of HP-IB interface hardware have added some more local messages which give access to special interface functions but which are not covered by the standard. In conjunction with interface hardware, local messages are also called auxiliary commands. The IEEE 488 standard describes the behavior of an HP-IB/GPIB interface as a number of states with conditions for state transitions. For each function (such as talker, listener, Serial Poll, Parallel Poll etc.) there are idle states where the interface is being placed after power-on. State transitions happen either by bus events (so-called remote messages) or by internal events or by programming the interface from the host or device side e.g. by firmware (so-called local messages). This example shows that after power-up and after any Interface Clear (IFC) the Listener function (L) first will be in the Listener Idle State (LIDS). In order to get addressed as a listener, the interface has to make a transition to the Listener Addressed State (LADS), which can be achieved by one of three actions: sending the lon message, sending the ltn message (works on active controller only) or being addressed by an LAD command (which requires being already in Accept Data State within the Acceptor Handshake function AH). Of course IFC must be unasserted, otherwise the interface would never leave LIDS. In LADS the interface knows it is a listener, however it will not be able to receive data before ATN gets unasserted, which puts the interface from LADS into the Listener Active State (LACS), where the interface can participate in the data handshake. When the controller asserts ATN, this is a signal to the interface that the next handshake will transport a command rather than data, which puts the interface back into LADS until ATN gets unasserted again, or the interface gets unlistened by either UNL, being addressed as a talker, or receiving the local lun message (again works on active controller only). To be more precise, also the local message ton will put the interface back from LADS to LIDS. 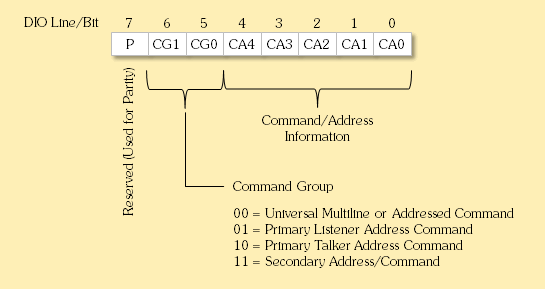 Note that when using extended addressing, there are variations since for being addressed also the secondary address must match, this is then covered by the Listener with Extended Addressing (LE) state diagram. So in general, implementation of interfaces will be done as a number of state machines (in total 12 for full implementation of the standard) each reflecting the current state for one of the implemented HP-IB functions. Within each state, the state machine recognizes a defined set of messages. All other messages are ignored for that function. Because all state machines are described in detail within the standard, it works out relatively easy to implement interface hardware which fully complies to the standard. The interface designer then may concentrate on the connection between the interface and the internal processing logic of the device (which is normally implemented by a set of registers mapped into the system memory). With programmed I/O the processor talks to the interface's registers only. This requires the processor to permanently keep track of the interface status and handle over data bytes in both directions when the interface signals there is new data available or when it is ready to send the next data byte to the bus. With interrupts, the processor can ignore the interface and keep doing other things unless there is a need to receive or send data or to service a device in case the processor is working on the active controller. Once there is a need to transfer data or service a device or some other change on the bus has to be handled, the interface generates an interrupt message for the processor, which then can handle it within a proper interrupt service routine. With DMA, the processor even does not have to be involved in data transfers to or from the interface any more once they have been started. The interface utilizes the system DMA controller to directly copy all data between a designated memory buffer and the HP-IB bus. This method does not only free the processor from the task of moving data between the interface and the buffer, but also ensures a maximum transfer rate on the HP-IB, especially when combined with a FIFO buffer. I am not sure which had been the very first device which implemented the HP-IB interface. 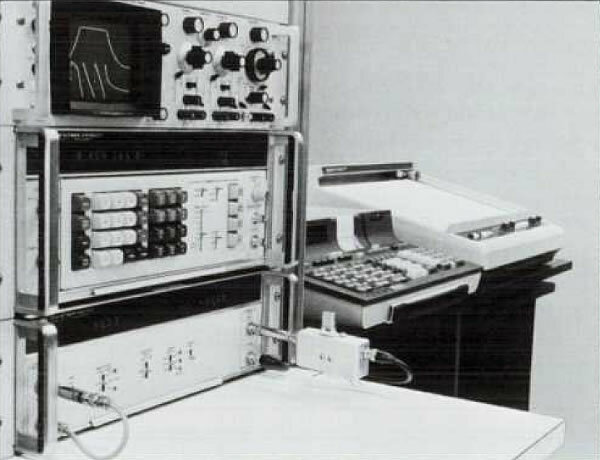 However first mentioning of HP-IB seems to be in the October 1972 issue of the HP Journal, where a "Common Digital Interface for Programmable Instruments" was introduced, together with the new 3570A network analyzer which was intended to talk with an HP 9820A calculator equipped with an 11144A HP-IB interface kit. 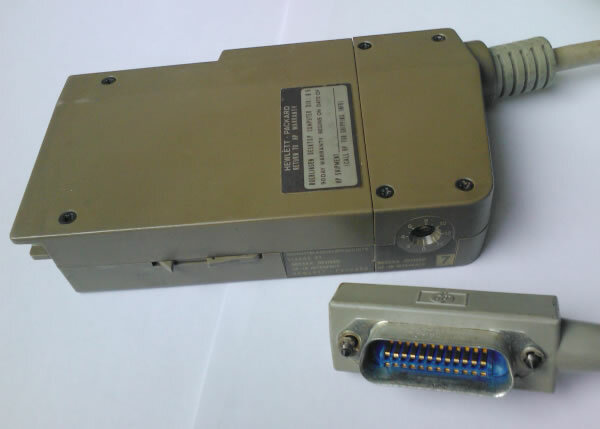 The 3570A featured an HP-IB interface for remote control with 36-pin edge connector, so a small 11235A adapter was needed to connect to an HP-IB bus (similar to Commodore's PET, see below). 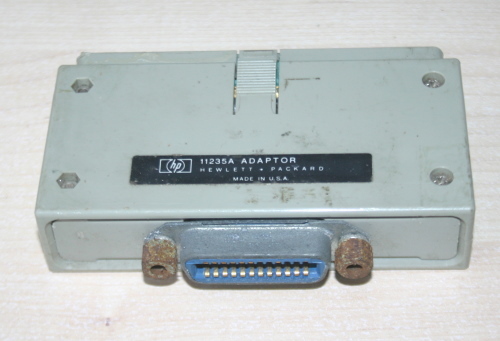 Another type of HP-IB connector was featured by the 3260A card programmer (19-pin round connector). Both the 3570A and the 11144A implemented their HP-IB interface with discrete components. 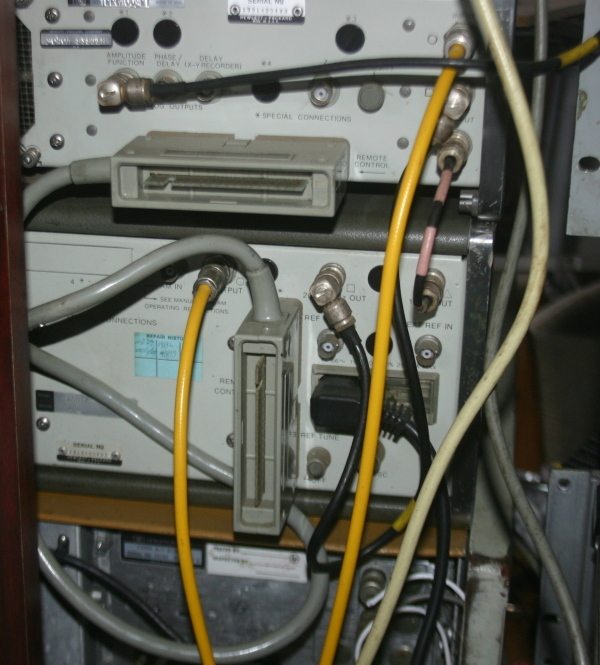 A typical network analyzer setup then included a 3570A with 11235A adapter, a 3330B frequency synthesizer, plus a 3260A card programmer or (alternatively) a 9820A calculator as controller, all connected via HP-IB. This early version of the HP-IB also was called 'ASCII Bus' since it had been designed for compatibility with the ASCII interchange standard (in contrast to BCD interfaces which also could be used as remote control for instruments). It still had some differences to what later worked out as a standard, so for example the ATN line was named MRE (Multiple Response Enable) and the IFC line was named EOP (End Output), the receiver handshake lines were nominally positive true, and and the EOI line did not yet exist. However, the principle was the same as what later was approved as a standard. Soon (in 1973) also the 2100A computer was equipped with the 59310A HP-IB interface kit, again implemented with discrete logic. Information from the July 1972 issue of the HP Journal in fact suggests, that there was an even earlier version of the ASCII Bus called 'party-line' bus (probably because it already featured connectivity of up to 15 devices on the bus with individual addressing). This 'party-line' bus did work utilizing only 10 lines, with 7 lines for ASCII data and three control lines (Remote Enable, Response Enable and Data Valid). In fact the 3260A card programmer as well as the 3320A/B and the 3330A/B initially had been available in 1972 with a so-called ASCII remote control option (Option 005), which was described as "bit-parallel/word-serial ASCII programming option [...] it has eight input lines thus allowing direct interface to the 3260A Marked Card Programmer, photo reader or any other 8-bit controller. [...] It allows bit-parallel word-serial digital remote control of all functions. A 3320B with this option will recognize an address and then accept instructions in a 7-bit parallel ASCII code. Due to the addressing feature, up to 10 3320Bs may be programmed from one programmer". It looks as if the 'ASCII remote control' is exactly that 'party-line' bus" described in the HP Journal, and as such had been some kind of predecessor of the later HP-IB 'ASCII Bus', probably supported also by the 2100 computer. In fact the Option 005 was soon replaced by another Option 007 HP-IB (thanks to Dave Caroline for the hint). Later HP switched to microcontroller based solutions, where most of the logic was implemented in software with a standard multi-purpose processor such as HP's own Nanoprocessor (as is is implemented in the 98034A/B HP-IB interface). 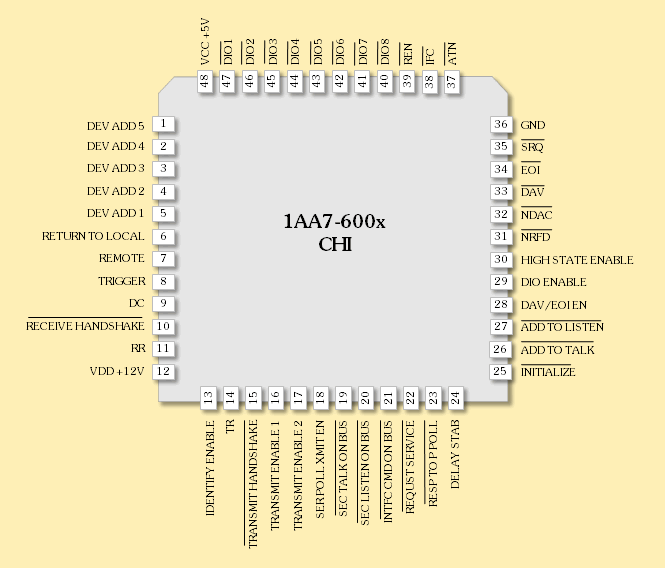 With the PHI (Processor-to-HP-IB Interface, P/N 1AA6-600x), its DIL-variant ABI (Advanced Bus Interface, also known as Medusa, P/N 1TL1-000x) and the CHI (CPU-to-HP-IB Interface, P/N 1AA7-600x) chips Hewlett Packard created its own specialized HP-IB controller chips. 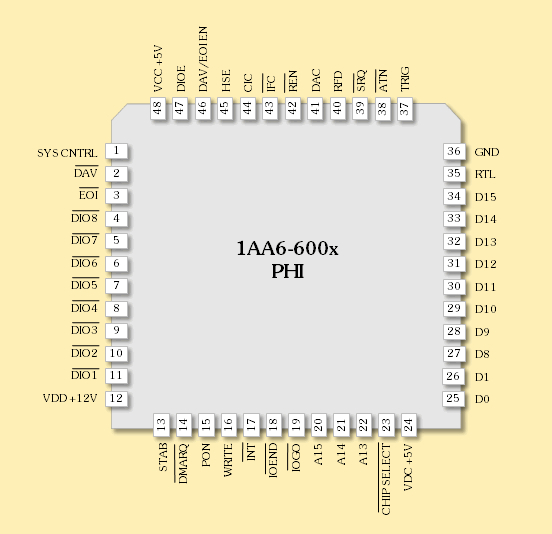 The ABI chip is internally fully compatible to the PHI chip but has a built-in CRC function. In fact the PHI chip is one of the very first HP chips produced using fast and power-saving Silicon-on-Sapphire (SoS) technolgy (HP's SoS chips start with P/N 1AAx). Both PHI and CHI chips use (at the time) innovative zero insertion force (ZIF) sockets with pressure mechanism (very similar to sockets of current generation processors). Whereas the PHI chip can be found in a large number of HP equipment (e.g. the 98041A hard disk interface or the 9895A dual floppy disk drive and many more), the only secure information on a product with the CHI is the 7970E magnetic tape drive, where the CHI chip interfaces the HP-IB to the Nanoprocessor, and the 9875A dual tape cartridge drive, where the CHI accompanies the BPC processor and the TACO tape controller. The ABI chip is found in the 98625A (high speed HP-IB) Disc Interface for the 200/300 series and in the 12009A HP-IB interface for the HP 1000 computer. At the same time HP started to use 3rd party chip solutions such as TI's TMS9914, NEC's µPD7210 or Intel 8291A HP-IB processors especially within some of their low cost products (for example the 8290x floppy drives are using the NEC µPD7210, and many SS/80 drives are using the Intel 8291A). 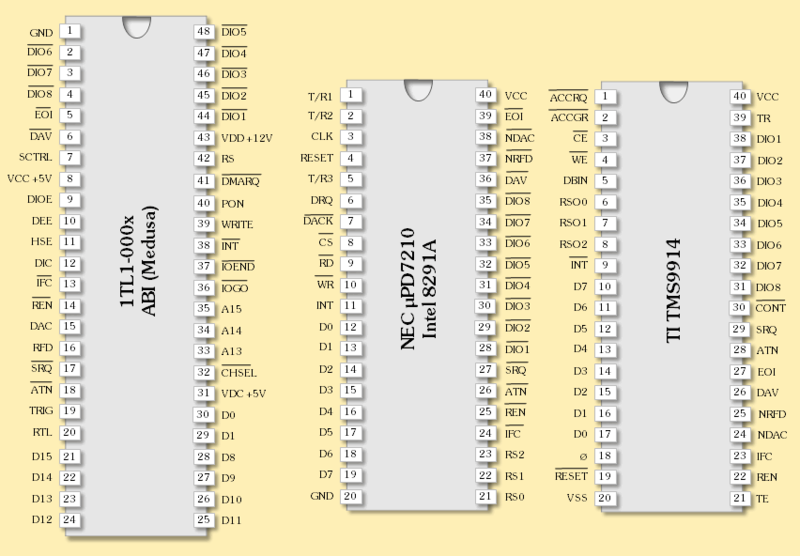 The Intel 8291A is pin compatibel and widely register compatible to the NEC µPD7210, but lacks the controller functionality and does not detect SDC when in extended addressing mode. In some devices also Motorola's MC68488P IEEE 488 controller was used (e.g. in the 91114A graphics tablet). Later HP designed its own GPIB chips based on the 9914 core functionality, until instrument business was passed over to HP's Agilent spin-off in 1999. Today Agilent offers state-of-the art GPIB solutions for PCI, PCI-Express and USB, as do other vendors such as National Instruments or Keithley. Some GPIB interfaces from National Instruments also offer bus analyzer capability. HP's AMIGO computer was completely built around the HP-IB. Not only the periperals such as floppy disk drive, hard disk drive or printers where integrated by the HP-IB bus, even its so-called Integrated Display System (IDS), the main workstation console of the AMIGO system, was connected to the main system by HP-IB. For that computer also a "channel" language was developed for controlling mass storage devices via HP-IB, the AMIGO command set. During a period, HP offered special ISA measurement extension boards for standard PCs holding a complete HP 9000 series 200/300 computer (Viper cards), including an HP-IB interface. Peripherals with HP-IB include printers (such as the famous Think Jet), plotters (e.g. the 7440), graphic input devices (such as the 91114A), paper tape and card puncher & reader, magnetic tape drives (e.g. the 7970E) and a large number of floppy disk and hard disk drives. Also HP's external graphics processors like the 97060A were controlled via HP-IB. See the Peripherals Section for a large number of devices which could be used by the HP 9845. For connecting the HP 9845 to an HP-IB bus system (or just a peripheral mit HP-IB interface), a revised 98034A (rev. E) or 98034B interface is required (the revision fixes a bug with the Service Request). The 98041A disk interface in principle is also an HP-IB interface, but intended only for connection to the 7905, 7906, 7920 and 7925 hard disk drives (it makes special use of secondary commands and is optimized for high troughput with 16-bit wide data DMA transfers between the host and the interface plus FIFO). Programming the HP-IB gets more comfortable on an HP 9845 with an I/O Option ROM set, which includes additional BASIC statements for all common HP-IB commands. Commodore's PET systems all provided a (low-cost) edge-connector port electrically compatible to the IEEE 488 standard, which was mostly driven by the already installed general purpose 6520 Peripheral Interface Apapters (PIA) and the 6522 Versatile Interface Adapter (PIA), which allowed connection to printers and mass storage devices via IEEE 488 with a special cable (edge-connector to HP-IB connector). Actually Commodore drove a somewhat strange policy with the PET. On one side, the PET can be considered to be the probably cheapest computer of its time capable of acting as an IEEE 488 instrument controller, on the other side Commodore decided to design their peripherals (except the cassette drive, of course,) such as printers or floppy drives, as IEEE 488 devices. Even worse, Commodore decided to include the whole disk operating system within the mass storage device instead of running it on the computer itself. Which resulted in a highly complex peripheral design, with costs per peripheral easily topping those of the computer itself. Totally contrary to e.g. how the Apple II was designed. The overall performance on the IEEE 488 was quite low. Even when programmed in assembly language, 5,000 bytes per second was the limit. Anyway, based on this decision the programming interface for talking to IEEE 488 devices is quite simple and mainly implemented in PET BASIC by the OPEN, INPUT#, GET#, PRINT#, CMD and CLOSE statements. LOAD and SAVE can be directed to IEEE 488 devices as well. There are a couple of restrictions with the built-in IEEE 488 support for those commands, as device numbers 0 to 3 are reserved for keyboard, cassette and video display, so that only devices with GPIB addresses 4 to 30 can be addressed. Also, some IEEE 488 functions such as Service Request (SRQ), Group Execute Trigger (GET), Parallel Poll and Serial Poll, Device Clear and Device Trigger have no equivalent in PET BASIC. However, since PIA and VIA can be directly programmed via PEEK/POKE or in assembly language, the missing functions may be emulated by the programmer himself. 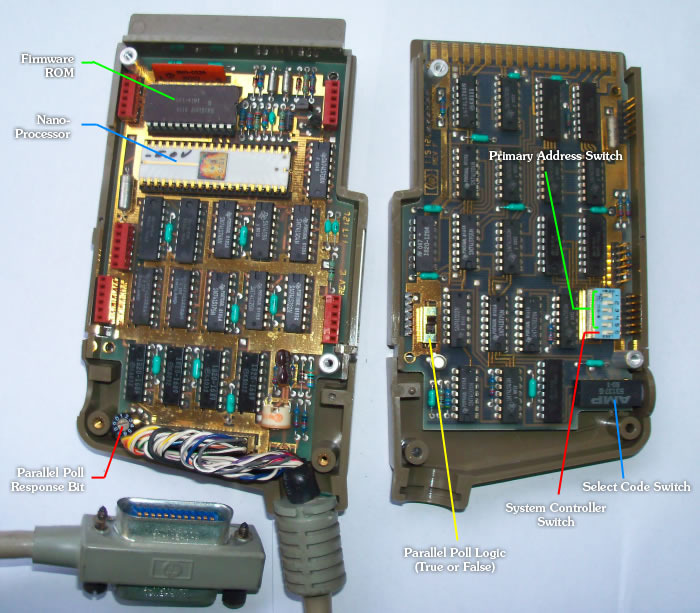 TI's TMS9914 and NEC's µPD7210 since introduced in the early 1980's represent some kind of industry standard for the interface towards the processor. Almost every GPIB chip which had been developed since then is more or less compatible to either the TMS9914 or the µPD7210 or both. Some manufacturers such as National Instruments have created ASICs which are based on the TMS9914 or µPD7210 programming model, but have greatly extended the capabilities towards more functionality, higher throughput or better reliability. For working with an HP 9845 and many more of HP's vintage systems, we make widely use of the HP-IB/GPIB with the tools and procedures which are presented on this site. So with HPDrive for example there is an MS Windows based mass storage emulator which needs an HP-IB/GPIB interface to run with, also with another utility HPDir it is possible to remotely access HP's old mass storage systems via HP-IB/GPIB. Other tools emulate a plotter or a graphical input device (tablet), such as the Digitizer/Plotter/Sound project. Even troubleshooting an HP 9845 is simplified by connecting the PC to an HP 9845 and using the PC's keyboard and screen to remotely control the HP 9845 via HP-IB. For mass storage systems HP developed its own high-level mass storage access and control languages (AMIGO, CS/80, SS/80) which filled the gap of task specific command format definitions which had been intentionally left open by the IEEE 488.1 standard. For some reason HP decided quite early to use a propriatary sequence (UNT with following secondary command, see the appropriate paragraph above) for the identification of their own equipment on the HP-IB bus, which had not been part of the IEEE 488 standard and so is not automatically supported by 3rd party products. As a consequence, it is not possible to emulate all of HP's devices with every HP-IB/GPIB controller interface, even not if it is from HP or Agilent themselves. HP-IB also played a central role for HP's early workstations until 1990, where HP-IB was considered at HP as the standard peripheral interface. So all of the HP 9000 series 300 and most of the series 400 workstations have a built-in HP-IB interface, mainly for slower peripherals, and can be equipped with a faster HP-IB implementation (normally based on the Medusa chip) with FIFO and DMA capability for fast mass storage access up to 1.5 MByte/s. Around the year 1990 this changed, and SCSI became the new standard for connecting mass storage devices also for HP's new workstation lines. HP-IB drivers have been incorporated in most of HP's computers and calculators firmware or operating systems. Until today there is support for the HP-IB within HP-UX. A driver package also has been developed for Linux covering the most common GPIB interface controller chips. Windows drivers are normally included when purchasing a GPIB interface for the PC. The most common application for GPIB today probably is National Instrument's LabVIEW, a multi-purpose lab instrumentation programming framework. Another important example is TransEra's HTBasic, which was derived from HP's own Rocky Mountain Basic and later HP Basic for Windows, all supporting at least GPIB hardware with internal register sets compatible to that of the TI TMS9914 and the NEC µPD7210. State-of-the-art chip solutions provide all GPIB functionality including bus interfaces to the PC in one single ASIC, requiring just the external transceivers for a complete interface solution. In general there is not so much need to program the HP-IB on an HP 9845, since the HP-IB is perfectly integrated into the HP 9845's operating system. So most devices when attached to the HP 9845 via HP-IB can be just used as mass storage, graphics device, printer etc. without knowledge what is going on behind the scene. But sometimes we need to get direct control of the HP-IB, for instance when measuring data from a digital volt meter shall be captured or when we want to connect to a modern PC. Using the HP-IB from an HP 9845 is easy if you got an I/O Option ROM set installed. All the addressing and other complex things are done automatically, however you can still get full control over the bus if you need to. Normally the HP 9845 acts as a system controller, i.e. the 98034 interface is configured by jumper as a system controller with primary address 21. Since more than one 98034 interface may be plugged into the HP 9845's rear I/O bay, using an HP-IB interface requires identification of that interface via select code. Default for HP's HP-IB interfaces is select code 7, but in principle any of the available select codes (normally between 1 and 12) can be assigned with the interface's select code dial switch (you don't need to open the interface). finally starts sending the byte string to that device. This is the normal way how data is sent if the computer is the active controller. Note that the HP 9845 automatically adds two characters, a Carriage Return (hex 0D) and a Line Feed (hex 0A) to the data string above. finally starts receiving the byte string and storing the data into the specified variable. Note that neither DMA nor word transfers are supported by the 98034 interface, so WHS, WFHS, BDMA and WDMA do not apply for HP-IB. with <primary address> and <secondary> both two-digit numbers between 00 and 31, and <terminator> any number greater than 31. As you can see, at least the <select code> is required as a valid address. When the computer is not the active controller, it cannot address any other device on the bus, but rather depends on being addressed itself by the active controller before any data transfer can take place. In that case just the select code is specified and the computer waits for being addressed either as talker (with OUTPUT) or listener (with ENTER). waits until the computer has been addressed as talker by the active controller, and then sends the data string to the bus without changing any address. This is the normal way how the computer sends data when it is not the active controller. This sends the data string to all current listeners without performing any addressing on the bus. Or, in other words, any MTA, MLA, UNL or UNT will be suppressed when the minus sign is used. Of course this requires a properly addressed state before, otherwise no transfer will take place. addresses the computer as talker (with MTA) and the devices with primary address 1, 2 and 3 as listeners before sending the data string to the bus. As you might expect, a single OUTPUT command may also be used in this way to send the same data even to multiple interfaces with different select codes and separate HP-IB networks. Obviously this option is not available with the ENTER command, since there may be no more than just one single talker on the bus. Which is just an alternative syntax with the first number denoting the select code of an HP-IB interface and all following numbers separated by comma specify the listener addresses on that interface. Of course by this notation, just one single interface is used. first addresses the computer with MTA as talker, and then sends LAD 1 plus the two secondary addresses/commands SAD 3 and SAD 15 to the bus. Note the 40 as an invalid secondary address is just terminating the list. Actually, using just the single digit '4' is ok as terminator. Sounds a bit complicated, but actually is seldomly used. The data transfers described above are in general intended for sending contents of one variable for receiving and storing the data into another variable, while preserving (or intentionally altering) the format of the data. So for example, string transfers will be automatically terminated with Carriage Return and Line Feed, or Carriage Return and Line Feed will be inserted automatically every 256 bytes etc. (see the I/O ROM Manual for more information on this). However sometimes the binary data should be transmitted without change, and this as fast as possible. The operating system of the HP 9845 has a special transfer mode for this, which is selected with the NOFORMAT modifier. No formatting or conversion will be done, and no intermediate buffer will be involved. In combination with the Fast Handshake (FHS) transfer types, this leads to maximum transfer rate. where <count> is the number of bytes which are expected for the transfer for proper termination. As already described in one of the paragraphs before, there are several options on how to signal to the receiver the end of the data transfer. The standard way is to use OUTPUT and ENTER without any other options. In that case, Line Feed will be recognized as terminator. The most reliable form of termination however is a combination of asserting EOI on the last byte and sending an UNT immediately after. This should be understood by even the most limited receiver. See the EOI command below. where <commands> and <data> are either variables or just comma separated bytes with the only difference that ATN will be asserted when sending the <commands> and unasserted when sending <data>. This gives full control over the ATN plus DIO lines, including addressing and parity (all bytes will be put on the bus unchanged), which can handle all transactions (espcially addressing and data transfers) where none of the other bus management lines is needed. The I/O ROM set supports any other command which is part of the standard, so you got full control of the bus. The following table summarizes the HP BASIC commands which can be used in addition to the OUTPUT, ENTER and EOI commands described above. EOI <select code>;<expression> Asserts EOI, then sends the byte resulting from <expression>, then unasserts EOI. TRIGGER [-]<address>1 Sends a Trigger command to one or more devices, depening on <address>. CLEAR [-]<address>1 Sends a Device Clear (DCL) or Selected Device Clear (SDC), depending on <address>. RESET [-]<address>1 Same as CLEAR. REMOTE [-]<address> Puts one or more devices into Remote Control mode with REN, depending on <address>. LOCAL [-]<address>1 Puts one or more devices into Local Control mode with REN and/or GTL, depending on <address>. LOCAL LOCKOUT <select code>1 Sends Local Lockout command to the bus, disabling the front panel controls for re-entering Local Control mode. STATUS [-]<address>;<variable>1 Performs a Serial Poll and reads the response from a device, depending on <address>. REQUEST <select code>;<value> Configures the Serial Poll response byte to <value>, and requests service (SRQ) if bit 6 of <value> is set. PPOLL CONFIGURE [-]<address>;<mask>1 Remotely configures a device to respond to a Parallel Poll, with the three least significant bits of <mask> denoting the response line, and bit 3 the condition (sense bit). PPOLL UNCONFIGURE [-]<address>1 Remotely disables Parallel Poll response for one or more devices, depending on <address>. PPOLL(<select code>) Conducts a Parallel Poll on the bus and returns the result. CONFIGURE <select code> TALK=<dev1> LISTEN=<dev2>[,dev3>...] Performs a bus re-configuration (addressing) without data transfer. PASS CONTROL [-]<address> Passes the active controller role over to another device. 1These commands leave ATN asserted upon completion of execution. 2ABORTIO should always be executed on program start, since the 98034 interface will not get properly initialized otherwise. See the I/O ROM manual for more information on those commands, their use, their options and their restrictions. The standard connector is a 24-pin Amphenol-designed micro ribbon connector, similar to those for Centronics parallel (36-pin) and SCSI-1 (50-pin). From the very beginning, the connector has been designed for stacking, i.e. every connector actually has two sides, one to the device and another for plugging in another connector. The connector gets fastened with standardized screws, so a number of stacked connectors can be securely fixed. It is recommended not to stack more than three or four connectors together in order not to overstress the construction. Also, the connector screws are designed to be tightened with fingers only. The screwdriver slots in the lock screws are for removal purposes only. Most HP-IB/GPIB connectors use black anodized metric ISO M3.5 x 0.6 fasteners. Some very old cables manufactured before 1975 have silver colored english UNC 6-32 fasteners. Do not try to mate silver and black fasteners, both can be damaged. The IEC625-1 standard actually defines another type of connector (MIL-C-24308 with 25 pins, same as RS-232). 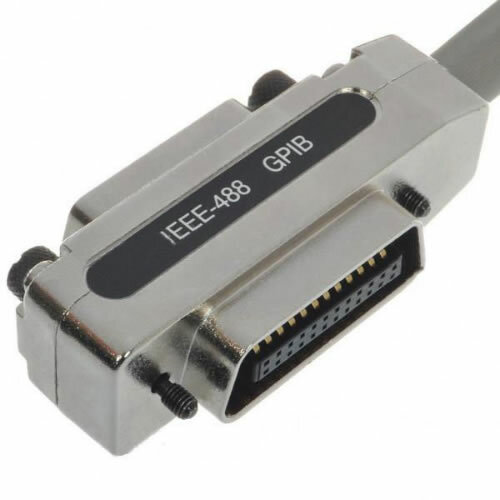 However, due to the high chance for connecting a GPIB cable to a RS-232 jack by mistake and the resulting damage caused by different electrical specifications, fortunately this type of connector is no longer in use for HP-IB. The connector seems a bit cumbersome today, especially when compared to micro versions of USB or HDMI, but it is rock-solid by design and actually had been a lean solution at the time of introduction. And reliability is what at the end of the day counts especially for lab equipment. Note that the size of the connector (typically 23 mm in height) in general leads to difficulties in installing two GPIB boards in adjacent ISA or PCI slots, which are specified with distance 20.3 mm. An HP-IB cable holds 24 lines: 8 data lines, 5 control lines and 3 handshake lines, with control and handshake lines each twisted with a separate ground line, all together shielded by a surrounding ground shield. Cables are available with different lengths. HP itself offered cables of 1, 2 and 4 m length (P/N 10631A, 10631B and 10631C). Also low EMI versions were available of 1, 2, 4 and 10.5 m length (P/N 10833A to 10833D). Bridging HP-IB/GPIB over long distances is normally achieved with two HP-IB extenders connected by coaxial cable or optical fibre. Early products were available since 1980. The HP-IB is still alive. Although many new instruments also provide alternative interfaces such as USB or LXI, the GPIB still is the most important standard for connecting digital measuring instruments. But of course, they are (at least in most cases) not connected to an HP 9845 any more. Concerning latency the HP-IB/GPIB still outperforms any other instrument connection type, but most important, it simply works. There are GPIB interfaces available for almost any type of system, you can get them with USB interface, or as a PC-Card, or as PCI card or as PCI-Express card. However they are no bargain, GPIB boards start at around USD 500, but - unbelievable - they are still working reliably with an original HP 9845 system (and many other vintage devices). That's what I call backward compatibility. If you don't want to spend that much for your personal HP-IB entry, consider acquiring a used board (used PCI boards start at USD 100 at eBay) or using a used legacy ISA GPIB board for USD 10-20 (you then of course need an old PC system with ISA slots inside). Due to the backward compatibility ISA boards are still a good value. For ultimate reference, of course the standard documents (either IEEE 488.1 or IEC625-1) should be consulted. They hold the authoritive specifications. However they are neither written nor intended as a primer, also they are not available for free (charge is currently about USD 100 for the IEEE 488.1/1987, you can get it here or the most recent IEEE 488.1/2003 which you can order here). So better first refer to one of the compressed descriptions if you like to get some better understanding of the HP-IB. A quite decent Tutorial Description of the Hewlett-Packard Interface Bus from HP also covers the IEEE 488.2 and the IEEE 754 floating point standards. Further recommended is the October 1972 issue of the HP Journal, since it tells about the original motivation and how everything started. Steve Leibsen has made a great summary on the HP-IB history on his website (click here for that article). And as always bitsavers.org and hpmuseum.net both provide tons of documentation on HP-IB equipment and also some tutorials. Also use the HP 9845 I/O ROM Manual as source for programming the HP-IB on the HP 9845, which you can find here. Good source are also the websites of the common manufacturers and vendors of GPIB interface equipment, first of all National Instruments as the currently leading GPIB controller company (although I still disagree with their non-disclosure policy concerning their GPIB chips), but also Agilent as HP's instrument successor, Keithley/CEC and Advantech as strong competitors and also INES as a Germany located company and many more.